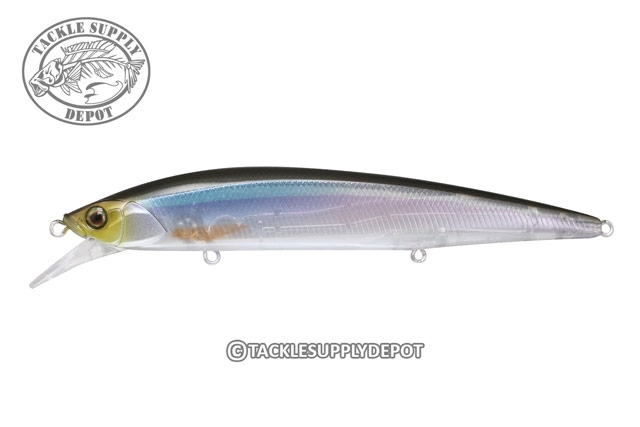 In terms of innovation and technical performance the Jackall Rerange Jerkbait is a step above all others and delivers a deadly twitch driven action that big fish won't be able to resist. The Jackall Rerange is engineered with an advanced TG Zero Friction weight transfer system that allows 20% of the lures weight to transfer during the cast for increased distance. A fluororesin coating on the internal tungsten weight creates a smooth shifting increasing casting performance as well as enhancing the action. The Jackall Rerange is unmatched in outright attraction and produces an erratic yet balanced lurch which lets bass know an easy meal is within range. Built with advanced internals that translate to superior performance and offered in a range of highly detailed colors the Jackall Rerange Jerkbait will stand above all others. I was shocked by how great this bait turned out. It's replaced the 110 and pointer 100 as my favrotie jerkbait. It has a very sturdy construction and hard flash. So far the RT Holo Minnow color is my favorite for clear water. The weight transfer system in this bait sends it a mile. Upgrade the trebles to #6 shortshank for a perfect suspend.